I have worked in the Information Center​ of the International Foundation for over two decades and responded to thousands of member requests for benefits information. There are a few information requests that fall into a category one could call perennial​​—asked so often that they go beyond “frequently asked question” status. Here’s where we turn to provide th​e answer to this perennial favorite . . . 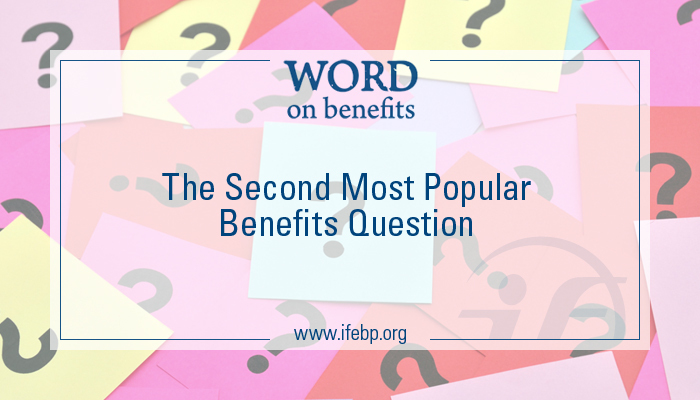 The U.S. Bureau of Labor Statistics regularly gathers data on employee benefits. If you’re looking for data on the share of pre​m​iu​ms paid by the employee for both single and family coverage, this page is very helpful. By clicking on the tables, you can find the data broken down by industry, employer size, region and type of employee. If you’re interested in copays, coinsurance and deductibles, you’ll need to try a couple of other links for private industry​ or for state and local governments. The Kaiser Family Foundation has been conducting a survey of employer health benefits for several years. They share a very substantive survey report on their website and it includes two sections related to worker contributions and cost sharing. The latest report includes dozens of tables/charts that slice and dice the data by plan type, employer size, region and industry. This survey also includes graphics that offer comparisons over time. You may also wish to check out other sections focused on prescription drug benefits and high deductible health plans. Several employee benefit consulting firms conduct surveys on health care costs and cost sharing each year. The full reports can be expensive and sometimes are available only to clients, but even a press release or summary of these surveys can provide some useful data. Here are a few examples from AonHewitt, Towers Watson/National Business Group on Health and Milliman. If you’re a member and interested in having quick access to this and other perennially popular questions, try InfoQuick on the Foundation’s website. You’ll find a list of over 100 frequently requested topics. Check off the ones that interest you, enter your e-mail address and click “submit.” Within moments, you’ll receive an e-mail full of relevant links for each of the topics you chose. Happy Reading! P.S. In case you’re wondering what the most popular question is, tune in to my next blog and you’ll find out!